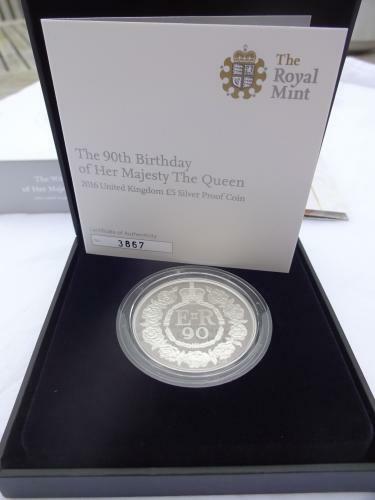 2016 Royal Mint Queen's 90th Birthday £5 Silver Proof Crown Coin. Solid .925 Sterling Silver, Weighing 28.28 grams, 38.61mm in diameter. Certificated Number 3867 from a Limited Issue of 9000 with Certificate of Authenticity. The Queen's Portrait is the Fifth Presentation, designed by Jody Clark with the reverse designed by Christopher Hobbs depicting a circle of Roses.